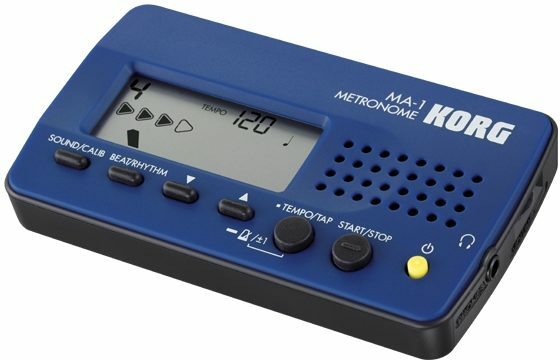 Say hello to an old friend that's looking better than ever: The Korg MA-1 Metronome. Accurate, reliable and easy to use, the MA-1 picks up where Korg's ever popular MA-30 left off. And, the unique beat counting display is informative and intuitive. The tempo can be set in pendulum steps, whole steps, or via Tap Tempo to accommodate the student and professional. An excellent practice aid, the MA-1 offers nine beats and eight patterns, including complex tuplets. The headphone output provides privacy. The MA-1 doubles as a tuning aid, creating a full octave of reference pitches for any instrument. - Rhythms: Quarter notes, eighth notes, triplets (straight triplets, triplets with inner beat omitted, triplets with the third beat omitted), sixteenth notes (quadruplets, quadruplets with middle beats omitted, quadruplets with the third and fourth beats omitted). - Dimensions (W x D x H): 102 x 59 x 17 mm / 4.02 x 2.32 x 0.67 in.